And “BOOM” there it was! There I was putting my son Caden into his tub and scrubbing him with tons of soap, thinking to my self how did I allow this to happen? I never thought in a million years this would happen. So going back a little bit, if you read my moms post today on her blog then you know that we went to the mall today. It was a mandatory must that I got Wreck this Journal today. I have wanted one for about a week now. So my mom and I decided to go to Barnes and Noble. Caden’s first mall trip. Before we left the house I had taken a picture of him in his car seat and he didn’t look to happy. 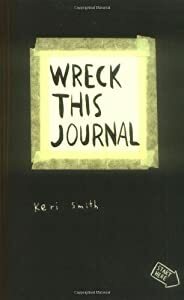 Cover of Wreck This Journal. This is what I so badly wanted!